Originally created for pregnant women. 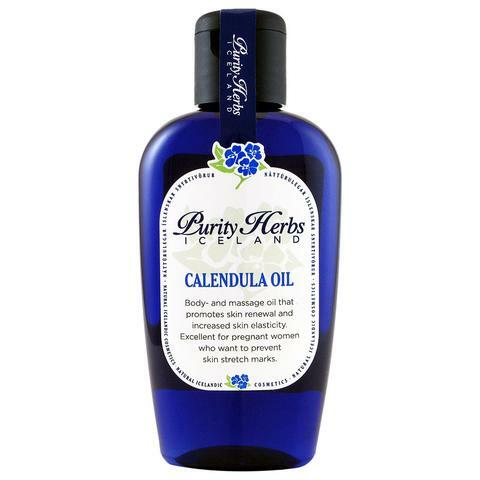 Exceptionally milk and nourishing, the Calendula Oil is one of Purity Herbs’ most popular body oils. Calms and soothes, proving maximum hydration. Great for damaged skin and scalps, rashes, and other disorders. Prevents stretch marks during pregnancy. Use as a massage oil or as body oil after a shower or the sauna. This oil is also very good for pregnant women who want to prevent the stretch marks. The oil is a mixture of sweet almost oil, jojoba oil, calendula oil and phyto squalane. Together, with the Icelandic herbs and the essential oils, Purity Herbs created the right balance of moisturizers a human body needs after dehydration due to sunlight, swimming, sauna, etc. Shepherd’s purse (Capsella bursa-pastoris) – Rich in vitamins and minerals. Externally the herb is used to treat wounds, eczema, and other skin disorders. Marigold (Calendula officinales) – Highly versatile and improving herb, good for dry skin and blisters. Prevents fungi and bacteria. This herb is often used in complexion creams and lions for cleansing, softening and soothing the skin, also shows very potent anti-oxidant effects. Butternut (Juglans cinerea) – Improves eczema, cleans and improves the skin. It does this through its cleansing effect on the gallbladder, liver and digestive system thereby promoting good skin tone.